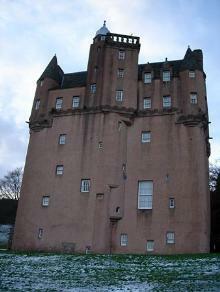 Pictured: Craigievar Castle, west elevation: before works. 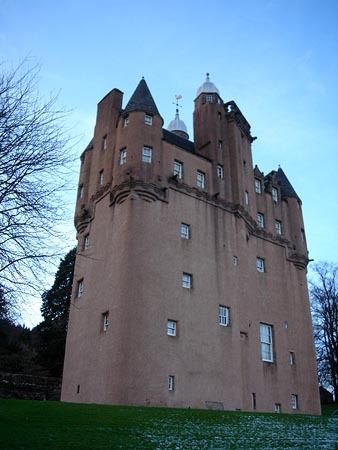 LTM were contracted by the National Trust for Scotland as principal contractors to undertake the restoration works. The primary aim of the project was to remove the strong, impermeable cement harl and to replace this with a more (technically, aesthetically and historically) appropriate lime harling and limewash to match the original finishes. 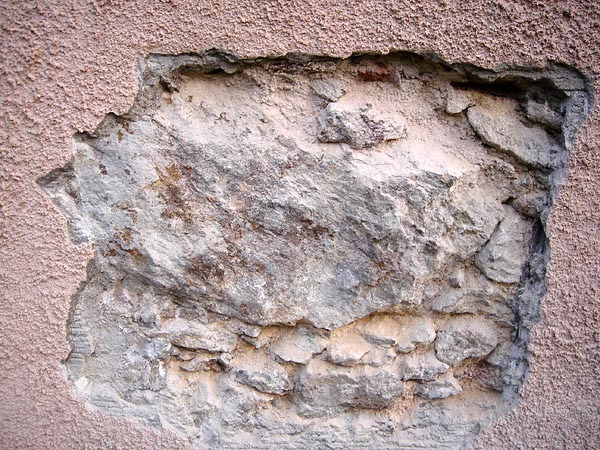 Works also included structural repairs to address masonry cracking and internal voiding. 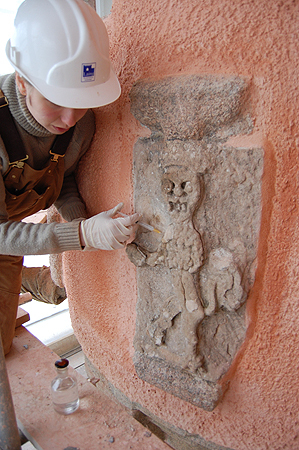 Finally, the careful conservation of a number of historically significant granite and sandstone carvings was undertaken by LTM’s Stone Conservator. 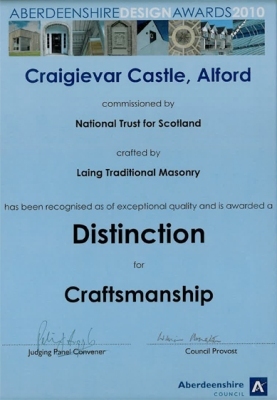 “One of the biggest stone-carving projects undertaken in Scotland...". 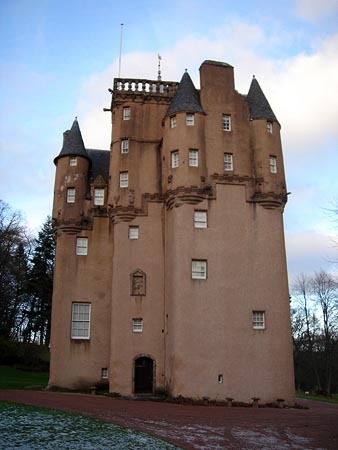 Pictured: Craigievar Castle, south elevation: before works. The location and geography of the site presented some logistical challenges to good site management. The confined area around the castle restricted access and required programmed delivery of materials. The fully enclosed scaffolding, a work of ‘art’ in itself, was secured to the ground rather than into the building. This prevented damage caused by scaffold fixings and assisted LTM masons in lime harling and limewashing. 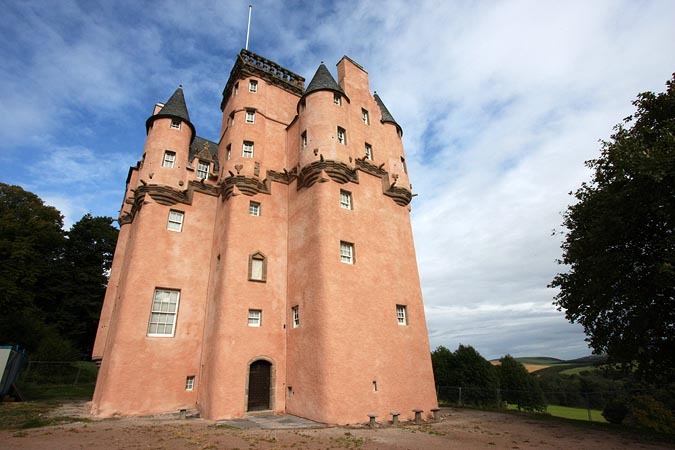 The restoration works themselves required strong site supervision and project management skills to ensure a safe working environment, co-ordinate the various sub- contractors and control the quality of workmanship. In addition, planned visits by the clients and other interested groups were a regular occurrence, and were safely accommodated within the site compound. 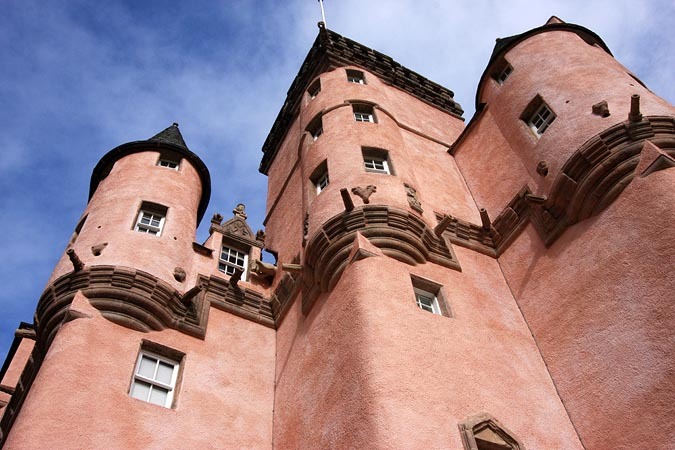 Pictured: Craigievar Castle: harling detail. 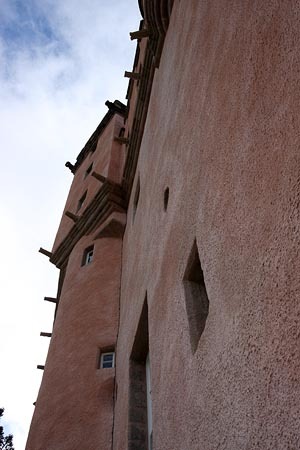 The existing cement based harling applied was not allowing the walls to ‘breath’. 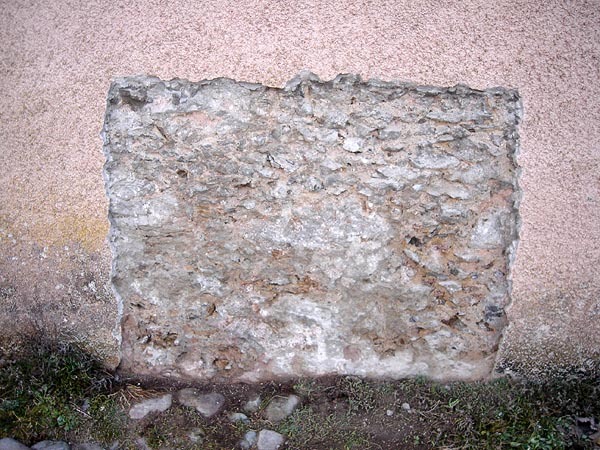 This dense, impervious mortar is incompatible with stone and lime construction and was causing internal damp problems, notably damage to the ornate plaster ceilings. 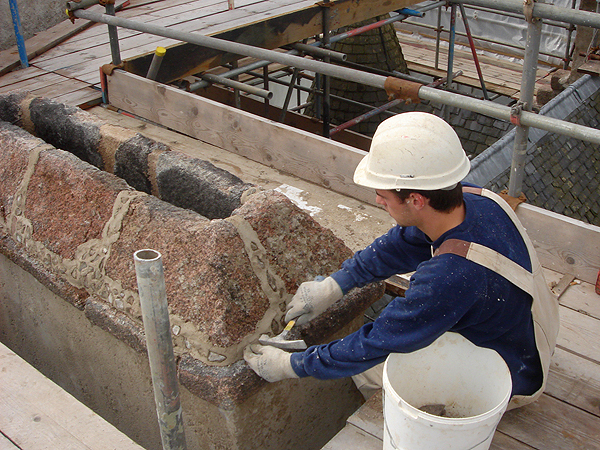 LTM masons carefully removed all the cement harl using hand tools to minimise damage to the historic masonry. 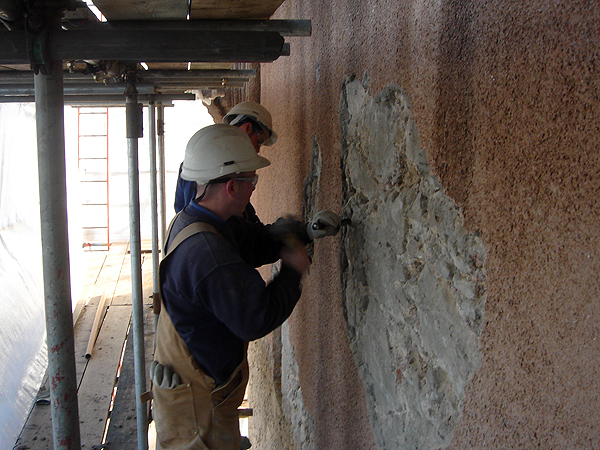 The presence of a cement slurry, applied to the granite rubble as a bonding coat for the cement harl, caused some difficulty as this would have affected the bond between the harling and the granite walls. 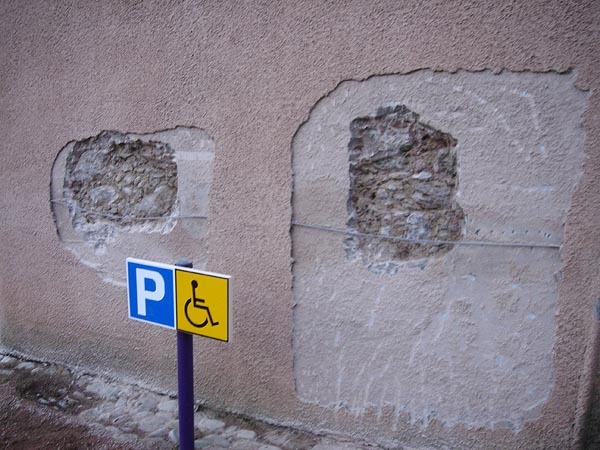 After considerable research and testing, it was agreed that a light grit blasting was the most appropriate method of removing this cement slurry coating from the surface of the granite. 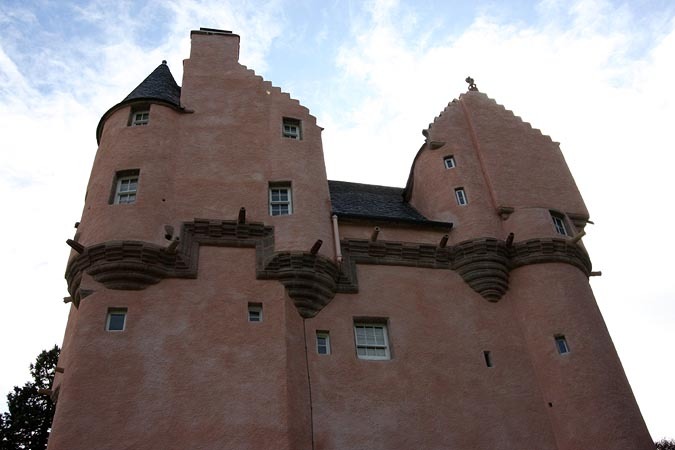 The harling was applied traditionally - cast on by hand using a Scotch harling trowel and hydraulic ‘hot lime’ mixes to provide good working characteristics, and to reflect the historic character of the materials. The original mortars were analysed in advance and were all traditional feebly hydraulic ‘hot lime’ mortars. 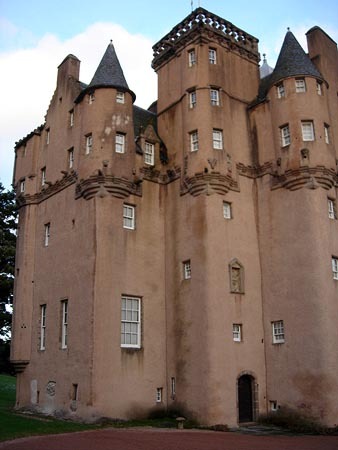 The limewash was a specially selected material made from a quicklime powder ground to a very fine particle size. Limewashes with a smaller particle size absorb further into the harling and provide greater durability and longevity. 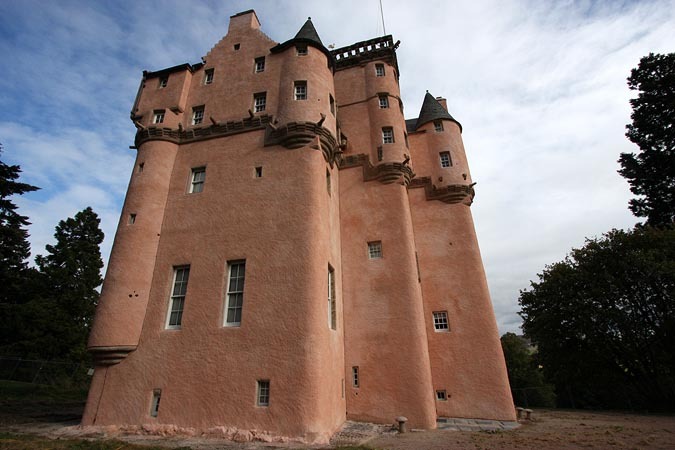 Natural earth pigments were mixed into the limewash to create the distinctive ‘pink’ castle you see today.